National Journal of Physiology, Pharmacy and Pharmacology (NJPPP) is an open access, peer reviewed, online and print journal. The frequency of publication is 12 Issue per year. 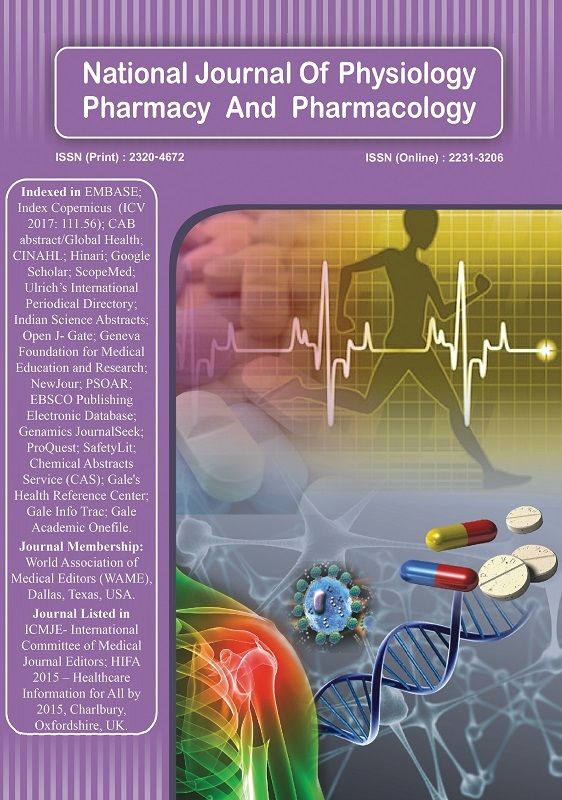 The journal is indexed in EMBASE, Indian Science Abstract, Open J- Gate, Geneva Foundation for Medical Education and Research, Ulrich’s International Periodical Directory Index Copernicus, Index Scholar, ProQuest, PSOAR, NewJour, JournalSeek Genamics, SafetyLit, CAS etc. The Editors-in-Chief in consultation with the Executive Editor, Assistant Editors and Advisory Board Members reviews all submitted manuscripts initially. Manuscripts with insufficient originality, serious scientific and technical flaws, or lack of significant message are rejected. .All manuscripts received are duly acknowledged. Articles accepted by peer reviewers would be copy edited for grammar, punctuation, print style, and format. At this stage the Managing and Technical Editors also do a Plagiarism Check. (NJPPP is strictly against plagiarism. Please read our Plagiarism Policy) . Page proofs will be sent to the corresponding author, just before the publication of article in the journal, which has to be returned within three days. Correction received after that period may not be included. The contributor may(not mandatory) provide names of two qualified reviewers who have had experience in the subject of the submitted manuscript, but who are not affiliated with the same institutes as the contributor/s. By submission to NJPPP entails that authors automatically attest that none of the parts of manuscripts is plagiarized from any other source. Proper reference should be provided whenever anything is extracted from a source. Technical editors use Plagiarism detection tools/softwares to ensure the originality of the article. In the case of suspected plagiarism, Author will be issued a notice to defend the charge of plagiarism and after going through authors explanation if committee think that authors justification is not correct in that case NJPPP committee would take immediate and strict actions against the authors ranging from rejection of the manuscript to preclusion of the authors from any future publication in the journal. Journal will report to the authors/s affiliating institution about author’s misconduct. NJPPP is a member of group of journals who follows ICMJE criteria (http://www.icmje.org/journals.html#N). Pre-Publication release of studies when detected by NJPPP journal is rejected summarily. However if clear and urgently important clinical implications for the public’s health that the news must be released before full publication in a journal is there , the appropriate authorities responsible for public health should decide whether to disseminate information to physicians and the media in advance and should be responsible for this decision. If the author and the appropriate authorities wish to have a manuscript considered by NJPPP, the Editor-in-chief should be informed before any public release when the policy of limiting prepublication publicity is waivedclear and urgently important clinical implications for the public’s health that the news must be released before full publication in a journal. However, if such exceptional circumstances occur, the appropriate authorities responsible for public health should decide whether to disseminate information to physicians and the media in advance and should be responsible for this decision. If the author and the appropriate authorities wish to have a manuscript considered by a particular journal, the editor should be consulted before any public release. If editors acknowledge the need for immediate release, they should waive their policies limiting prepublication publicity. Authors should mention about the ethical principles they followed during conduction of research and preparation of the manuscript. Manuscripts related to human subjects should mention about Informed consent, Permission from Institutional Ethics Committee (IEC). In the manuscript involving children more than 7 years, information related to “Assent” should also be mentioned. In the case of animal experiments, relevant national and international guidelines should be mentioned. Method of sacrificing the animals should also be mentioned in the manuscript. 1. Bavdekar SB, Gogtay NJ, Chavan R. Reporting ethical processes: Survey of "instructions to authors" provided by Indian journals. Indian J Med Sci. 2009;63:260-2. 3. Jaykaran, Yadav P, Kantharia N.D, Chavda N. Survey of “Instruction to authors” of Indian medical journals for reporting of ethics and authorship criteria. Indian J Med Ethics.2011;8:36-38. Each author should contribute substantially in each of the areas mentioned below. Gifted and Ghost authorship will not be tolerated. Contribution of each author should be mentioned in the first page/title page of the manuscript. The editors and the publisher disclaim any responsibility or liability for statements and opinions expressed in review articles, original papers, short communications, letters to editor, editorials and supplementspublished in the Journal. Neither the editors nor the publisher guarantee, or endorse any products or services advertised in this publication, nor guarantee any claims made by the manufacturer of such product or service. Publication charge (For DOI no., Conversion of XML file, website and copy editing) is 5000 Rs for Indian author and 150 USD for authors of countries other than India. This fee is for standard 7 page article (300 words per page) article for pages more than this there will be extra 500 Rs per page. All accepted article will be copy edited for grammar, language, punctuation by professional copy editors and this will cost us significant portion of publication fee received by you. Charge for hard copy will be extra Rs 1000. To decrease publication charges authors are requested to restrict the articles to 7 pages maximum . Letters and Letter to the editor in response to published studies in the journal will be published free of charge. Authors should contact editor at editornjppp1@gmail.com to know bank detail. Waiver of publication fee: Partial waiver of publication fee is possible for genuine reasons. Author can send a mail to editor for partial waiver of fee. All manuscripts should be prepared according to the guidelines given by “Uniform requirements for Manuscripts submitted to Biomedical Journals” given by “International Committee of Medical Journals Editors”. Link to templates for different articles is given above. Read this article carefully before preparing the manuscript.